You are here: Home / LIFESTYLE / Beauty / Fabulous Foot Care Tips All Women Should Follow! Fabulous Foot Care Tips All Women Should Follow! When it comes to taking care of ourselves and our bodies, our feet are often overlooked. But it shouldn’t be the case as our feet work incredibly hard. They support our entire body weight, and when we walk, run or move around they can become tired. Plus they’re trapped in socks and shoes all day meaning they’re prone to things like fungal infections, blisters and other issues that body parts such as our hands don’t suffer with. If you’ve been neglecting your feet as part of your health and pampering routines, here are a few ways you can look after them. Soaking your feet in warm water can help to relieve tense and sore muscles, perfect if you’ve been standing, walking or exercising all day. If you add some epsom salts to the water, this can help to reduce inflammation, boost circulation, quell foot odour and help with fungus, dry skin and even ingrown nails. You could soak your feet in a regular tub, or invest a little extra in a foot spa. These will have massage and jet functions which will make your foot soak even more effective and enjoyable. If you like your water to stay hot, boil a kettle and keep it next to you, then carefully top up the water as it starts to cool. You could even add a few drops of your favourite essential oils to the water too. We need a little rough skin on our feet to protect them, however they shouldn’t be hard and leathery. If they get to this point they can crack, bleed and become infected- not to mention look pretty terrible! Regularly buff dry skin on the feet using a pumice stone or a file like a Ped Egg, this will keep the hard skin to a minimum. Invest in some good pampering foot products, rich moisturisers, scrubs and oils. Not only will this prevent them from getting sore but you won’t scare people any time you’re barefoot or in sandals! Foot massage isn’t just good for the feet, it’s actually beneficial for the entire body. Since many long nerves in the body end in the feet, massage and stimulating them can provide benefits elsewhere. For example, massaging the big toe can help with headaches, whereas the arch of the foot can help with digestive issues. You could watch some Youtube videos and learn self massage techniques, rope in a partner or treat yourself to a foot massage at a spa or salon. Make this part of your regular pampering or self care routine, not only will your feet feel less achy but you will boost your wellbeing and could even improve other areas of your body in the process. Badly fitting or fashionable shoes can cause all kinds of problems with the feet. Worryingly they can cause bunions, bunion surgery can help in this instance but they are incredibly painful and can be avoided with the right footwear. Never squeeze your feet into shoes, if your feet are wider then opt for a wide fit. Spend some time walking around in the shoe shop before making a purchase, you need to make absolutely sure they are comfortable. Put on thick socks and spend time breaking in stiff shoes before wearing them to prevent blisters. And cushioned or gel insoles will help to absorb shock keeping your feet more comfortable, particularly if you’re wearing heels. Heels are particularly bad for your feet and your posture, while they look super glam if possible keep them to special occasions. Especially if you’re on your feet for a lot of the day, go with some smart flats instead. Finally, keeping your nails in check is an important part of your footcare routine. Nails that are left to grow too long can dig into your shoes. Toenails can also fall victim to things like fungal nail infections– this can spread to other toes and to other people so has to be sorted quickly if you notice symptoms. In public showers such as at the gym, wear flip flops to avoid fungal nail infections, as well as warts and verrucas. 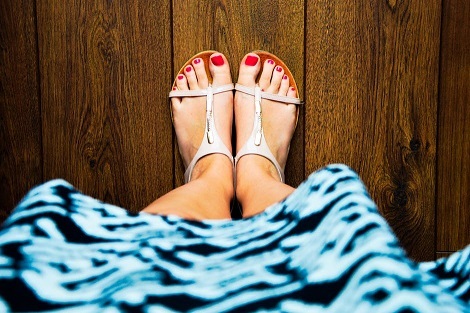 Keeping your toenails looking nice will also boost your confidence if you’re barefoot or in open shoes. You could paint your nails yourself, or book yourself in for a pedicure as a treat. How do you keep your feet looking and feeling their best?